With the bone-chilling memory of another brutal winter still fresh in mind, consider for a moment: Would you invite a secretive, shoeless old stranger into your home on a stormy night? If so, would you wash his half frozen feet and then get him settled into your guest bedroom? Would you continue to house this stranger once the storm had passed; clothing and feeding him with no questions asked? Would you trust him with your possessions while you were away? Allow him to befriend your dog? Most importantly – would you hide such a stranger from your friends, your neighbors and even your family? Most of us would quickly say ‘No’; but for one purposeful young woman, stepping out of her stagnant solitude and into such a wind-blown way of life forms the intriguing foundation of Black Krim – the debut novella by Kate Wyer. In carefully fleshing out her engaging work of narrative fiction, Wyer guides the reader through the workaday journeys of three disparate individuals – juxtaposing their inner monologues against a series of clipped conversations, while presenting a story almost as painful as it is perplexing. Who are these people? And what secrets simultaneously bind and yet keep them apart? The unfolding drama in Black Krim revolves around three central characters: Corbina – a hard working but otherwise solitary woman; her bedeviled mother Brigit; and Martin – a mysterious older man who suddenly fills Corbina’s lonely life. Yet Corbina’s reason for taking in Martin is almost as abject as the ungainly tomato. Martin may be Corbina’s secret, and Brigit has several secrets of her own, but the overriding mystery which drives Black Krim revolves around the enigmatic Martin. Here is the strength of Wyer’s work: to take a simple hook such as a disheveled old man – walking aimlessly in the snow – and build a compelling drama around a character many would see as uninspiring. At first glance, some might find Black Krim to be unsettling, especially if alternating first-person narrative is not one’s cup of tea. However, Wyer’s steady hold on the reins is just right, allowing the story to slowly build – making Black Krim a compelling read. While some of the writing is jarring or at times seems out of place, overall, Wyer keenly treads the chasm between the heart’s needs and its desires. This book is suitable for readers 16 and above and is highly recommended. Kate Wyer lives and writes in the Baltimore area, attended Goucher College, where she received the Elizabeth Woodworth Reese Prize, and earned her MFA from University of Baltimore. She also won the Women Writing About Women contest sponsored by the Mid-Atlantic Arts Foundation and was awarded a fellowship to attend the Summer Literary Seminars in Lithuania. 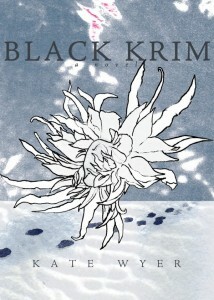 Black Krim (2014 Cobalt Press) features original artwork by Katie Feild. Black Krim may be found locally at the Ivy Bookshop in Mt. Washington and in Towson at Ukazoo. Black Krim may also be purchased directly from Cobalt Press and as a Kindle download from Amazon.